The Stroller Strides Fitness Stroller by BOB is the ideal on- and off-road jogging stroller, keeping families active for years to come. It's equipped with a coupon for Stroller Strides fitness classes by Fit4Mom and a Stroller Strides Fitness Kit by BOB, including a Handlebar Console, Stroller Strides exercise manual and SPRI fitness resistance bands. The Stroller Strides Fitness Stroller is amazingly versatile. The front wheel swivels, which allows for easy maneuverability through parks, city streets and other tight spots, but also locks for added stability when jogging or taking on rough terrain. And the handlebar adjusts, offering 9 positions to provide a perfect fit for parents of different heights. The Stroller Strides Fitness Stroller boasts an ultra-smooth ride for your little adventurer. State-of-the-art adjustable suspension takes bumps in stride. Boardwalks, beaches and trails are no match for this stroller. Your child will love the fully upright seating option and you only need one hand to adjust the seat angle. Keep all your supplies, gear and even a few toys in the extra-large cargo basket. And when you're done for the day, fold the stroller in seconds and get going. Combine the Stroller Strides Fitness Stroller with an infant car seat, like the BOB B-Safe 35 by Britax, to create the best travel system for your lifestyle. 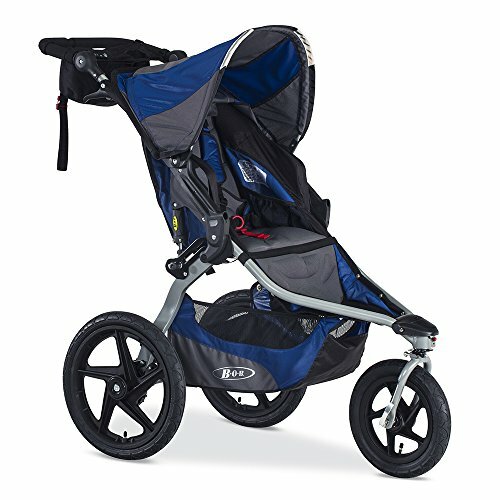 So go ahead - take your fitness to a new level with the Stroller Strides Fitness Stroller by BOB, the #1 jogging stroller. Comes with a Stroller Strides fitness classes coupon and a Stroller Strides Fitness Kit by BOB, including a handlebar console, Stroller Strides exercise manual and SPRI fitness resistance bands. If you have any questions about this product by BOB, contact us by completing and submitting the form below. If you are looking for a specif part number, please include it with your message.